Genetically pre-disposed to osteoarthritis, eg. large breed dogs. Displaying the clinical symptoms of osteoarthritis including lameness, stiffness, pain and a reluctance to run and play. Recovering from injury, surgery or those who enjoy a high level of physical activity. 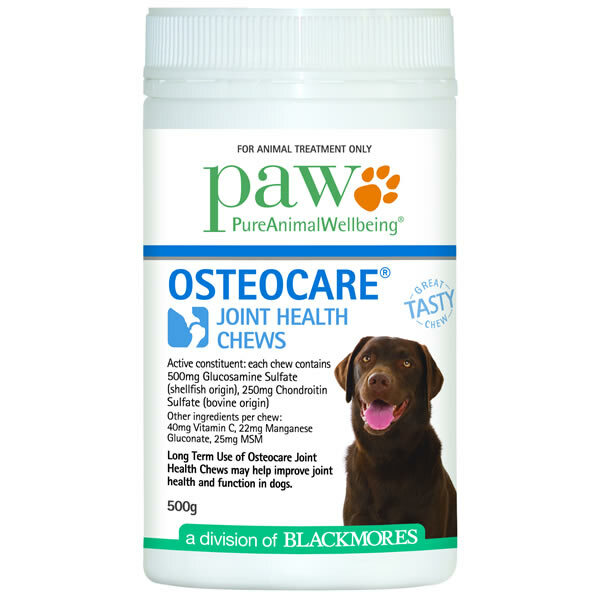 PAW Osteocare Joint Health Chews come in a 500g container of approximately 100 chews. 500mg Glucosamine Sulfate: to provide cartilage nutrition for optimal joint cartilage health and joint function. 250mg Chondroitin Sulfate: a major component of joint cartilage and is required for cartilage and joint health. A balanced combination of other nutrients such as MSM and a blend of vitamins and minerals that work together to maintain the health of your dog’s joints. 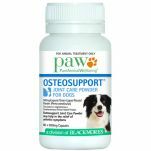 Read 1 customer review of PAW Osteocare Joint Health Chews. The average customer rating is 4. My dog loves the taste of these chews and has shown an immediate improvement in his mobility following a knee operation. Having early onset arthritis due to a damaged cruciate, I believe this product is enhancing the healing process and assisting with his stiffness on cold mornings.